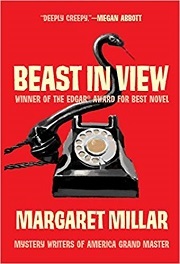 This old-school 1955 suspense novel by Margaret Millar features a fractured family whose secrets are being pulled out of the darkness by a resentful woman whose feelings have bred a sort of madness that makes her a danger to everyone that gets on her wrong side. The story begins when Miss Helen Clarvoe receives a phone call from an old school friend named Evelyn Merrick. Helen, a cold and solitary woman, doesn’t remember Evelyn, although she pretends to, but she’s unsettled by the phone call, which includes a reference to the money she inherited when her father died. So she calls Mr. Blackshear, the family financial adviser for help. Blackshear, recently semi-retired, takes up the case and begins looking into Evelyn Merrick. It turns out that Evelyn is more closely tied to the Clarvoe family than Helen recalled, but once the nature of the relationship is revealed, the situation begins to look even more sinister. Before long, people are dying. Yet, Evelyn herself remains a mystery, with people presenting altogether different versions of her. And the sinister phone calls and revelations go on. The plot in this book winds around quite a lot as new characters are introduced and new shocking twists revealed. It takes a while for the main thread to be revealed, but once it is, the book becomes pretty gripping. There’s some dark comedy, especially in a scene involving a doting mother. And the book’s climax is patently obvious once you look back but still something of a surprise (to me, anyway). The groundwork is well laid. This book was written in 1955, and it’s a book of its time, with some dodgy ideas about mental illness and homosexuality that may bother some readers more than they bothered me. For the most part, I think Millar was attempting to treat her outcast and troubled characters with sympathy without letting them off the hook in areas where they go wrong. (This is very much Ruth Rendell and Patricia Highsmith territory. In fact, this novel won the Edgar award over The Talented Mr Ripley.) I’ve hadn’t read any Margaret Millar before, and this appears to be her most highly regarded book, but if anyone would like to suggest others of hers that are worth reading, please do! I’d recommend Millar’s THE FIEND. It’s about a child molestor who is released from prison and moves in with his brother. Then a child goes missing, with predictable and not so predictable results. I think it was published in the early 1960s and Millar does a good job of showing a California beach community on the verge of expanding into what we think of as a “beach town”.